I’ve always enjoyed the hunt for a new book. Recommendations are especially welcome when they come from an author whose work I already appreciate. When several authors offer the very same suggestion, well, it’s almost impossible to ignore. 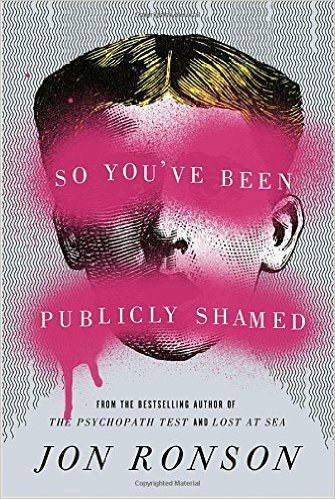 One such book is So You’ve Been Publicly Shamed by Jon Ronson. To date, it’s the best non-fiction book I’ve read this year. Chapter by chapter, I learned something awfully intriguing about this shaming phenomenon: many participants don’t realize they’re participating. At that point, Sacco powered down her phone for the 11 hour flight. By the time she landed, she’d become the top worldwide trend on Twitter. Her picture was taken at the airport in South Africa and posted online. Hashtags were created with her name as a means of vilification. The response in social media was scathing. Literally overnight, Justine Sacco went from a life of comfortable anonymity to experiencing the most nightmarish 15 minutes of fame imaginable. She lost her job. The media dug into her personal life, followed her, and portrayed her as a personification of evil. Unfortunately, the problem with this narrative was, by all accounts, Sacco was nothing like the person she’d been made out to be. As I read about Sacco, and several other individuals whose lives were dramatically altered due to public shaming, it gave me pause. Had I ever contributed to online shaming? Was a person’s life now different due to a final straw I placed upon the so-called camel’s back? I can understand the public’s appetite for retribution when someone behaves poorly. No one feels good when an injustice goes unresolved. On the other hand, I also felt empathy for those Ronson described who didn’t give a second thought to a Facebook or Twitter post and were subjected to unspeakable treatment. In some cases, the victims exercised poor judgment; in other cases, they were simply misunderstood. Either way, these weren’t “bad people” worthy of excoriation. What begins as an interest in righting a wrong leads to something much more damaging. Incidentally, It’s not uncommon for Person A to wish they could go back and handle matters differently. Thankfully, there is a prescription for handling things better. It’s found in the millennia-old teachings of a rather well known figure – Jesus. In Matthew 18, Jesus is speaking to his disciples. He tells them that when they have been wronged, they are to go directly to the offending party. Face to face. Of course, this isn’t easy for most people. And, in the online world, the faceless nature of criticism makes ignoring this guidance all too convenient. Dealing with conflict isn’t enjoyable. Doing so with a level head can be even more of a challenge. But the outcome can have a vastly different conclusion. Whether you fashion yourself a follower of Jesus’s teachings or not, it’s an admonition worth contemplating. No one benefits when someone is shamed. We humans have a habit of judging others by their actions, and judging ourselves by our motives. Not a very reasonable standard. Sure, there may be a season of guilty pleasure in feeling you’ve “outed” someone else. But, I would argue that a greater sense of satisfaction occurs when the end result is restoration. In Ronson’s book, many anecdotes involved people who never even knew each other. So, maybe spending an extra moment before imposing condemnation is called for – cooler heads can prevail. Reaching out directly to the other person in private is another wise approach. Maybe a tweet was simply misunderstood. Perhaps a conversation can help someone else recognize the weight of their decisions. Some of the most meaningful growth in my life has taken place when someone has pulled me aside in private when I fell short. At times, I was unaware of how I’d come across; and, boy, was I thankful for the way the other person handled it. So think twice the next time you’re tempted to post or retweet a snarky comment – even when you think it may be justified. It’s important to remember there’s an actual person on the other side of your screen. Because, in the end, grace and propriety are always more preferable than the alternatives.